In a new AJAX enabled application web form, add a RadColorPicker. Set the EnabledEmbeddedSkins property to false. 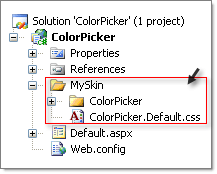 In the Solution Explorer, create a new "MySkin" folder in your project. Copy the default RadColorPicker skin files from the installation directory to the "MySkin" directory; copy both the \ColorPicker directory that contains the images for this skin and the ColorPicker.Default.css file that defines the skin styles. 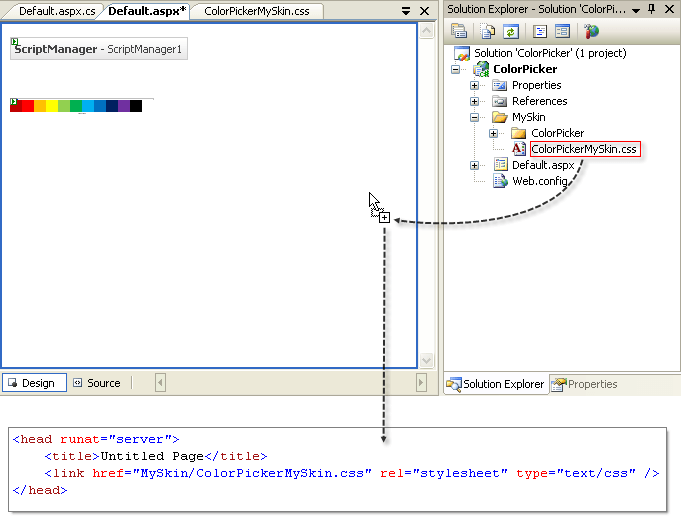 In the Solution Explorer, rename "ColorPicker.Default.css" to "ColorPicker.MySkin.css". 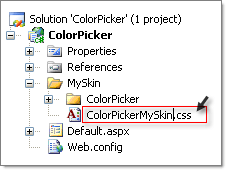 Open "ColorPicker.MySkin.css" for editing in Visual Studio. Press Control-H to invoke the Find and Replace dialog. 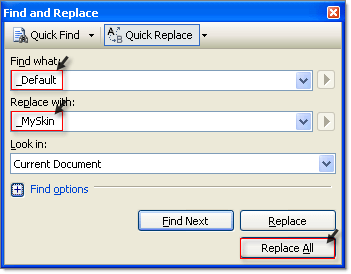 Set Find what: to "_Default", Replace with: to "_MySkin", and Look in: to Current Document. The style sheet should now look something like the example below. From the Solution Explorer drag the "ColorPicker.MySkin.css" to the design surface of the form. This step will automatically add a reference to the page "<head>" tag as a "<link>" as shown in the screenshot below. 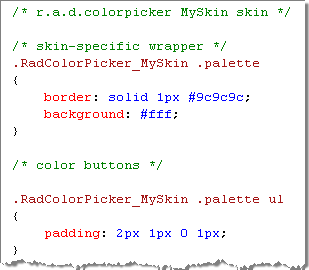 Change the Skin property of your RadColorPicker control to "MySkin". The classes that control the appearance for border of the color picker are the ".RadColorPicker_MySkin" and ".palette" classes. Locate the ".RadColorPicker_MySkin .palette" CSS selector and set the border to have a 2 pixel insert. Change the color picker background by located the CSS selector ".RadColorPicker_MySkin .palette .emptycolor" and ".RadColorPicker_MySkin .palette .emptycolor.selectedColor". Change the background-color to be "LightSteelBlue". Press F5 to run the application. Notice that both the border, "No Color" area color and preview text color has changed.